How much does it cost to travel to Dundee? How much money will you need in Dundee? £216 ($281) is the average daily price for traveling in Dundee. The average price of food for one day is £38 ($49). The average price of a hotel for a couple is £296 ($385). Additional pricing is in the table below. These average travel prices have been collected from other travelers to help you plan your own travel budget. How much money do I need for Dundee? The city of Dundee is in northeast Scotland and sits on the north bank of the Firth of Tay. The city dates back about 800 years and has a rich history. It's conveniently located less than two hours from Edinburgh, Glasgow and Aberdeen making it an easy journey for anyone looking to do a weekend trip. There's a handful of sights around town and some decent museums worth wandering through. The city is historically famous for the three J's; jute, jam and journalism. In the past Dundee was famous for its jute mills. These jute factories attracted a lot of immigrant labour and helped establish much of the character of the city. The last factory closed down in 2001 and now many of the old factory buildings have been converted into offices and apartments. Dundee is also famous for its jam and is reported to be the original home of marmalade. The jam was made from the berries grown at the surrounding farms and today you can still find some locally made jam. Finally, Dundee is home to the Dandy and the Beano comics, making journalism a mainstay in the area. 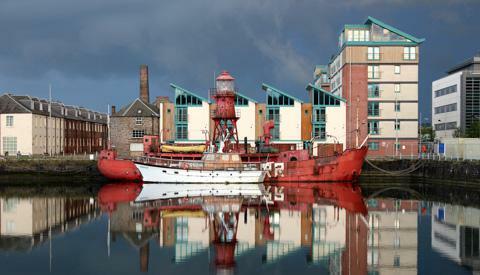 Dundee's climate is Oceanic and temperature and rainfall are typical of that found on the east coast of Scotland. The warmest month is usually July and the warmest day is usually around 25 degrees Celsius. There are a handful of sights, museums and galleries around town that are worth visiting. Make sure you check out McManus Galleries, Mills Observatory, Sensation Science Centre, Camperdown Wildlife Park, Broughty Castle, Discovery Point. Also be sure and walk through the Howff, which is a very old cemetery in the middle of town. It has tombstones that date back centuries, some of which are from the early 1600s. Verdant Works is a jute musuem that is located in a former jute works. It is operated by the Dundee Heritage trust and is worth a visit if you're interested in the city's history. For those who want a different experience, then a visit to Camperdown Wildlife Park will let you see brown bears, lemurs, wallabies, maras, otters and many different bird species. Most of the city's sights and attractions are concentrated in the city center. This is likely where you'll spend most of your time as a visitor. If you're interested in doing some shopping, then the Overgate and the Wellgate are your best options. These shopping malls are the largest in town and are located at opposing ends of the city center. They both have popular international chain stores such as H&M or the Gap. Another interesting thing to do in Dundee is to go to the Dundee Rep Theatre, which is where you can see the Dundee Rep Ensemble. This is Scotland's only fulltime company of actors. It is also where you can see Scottish Dance Theatre, which is the main dance company of Scotland. Dundee Contemporary Arts has two art galleries, a two screen cinema, a print studio and a cafe bar. It is also worth a visit. Other activities include hiking in the Highlands and guided walks through the city. The cafe culture has grown in popularity in Dundee in recent years and you'll find no shortage of cafes around town with outdoor seating options when the weather is nice. There are also many fast food or take away restaurants if you're on a particularly tight budget and are hoping to save some money. Nice sit down restaurants are easy to find as well. Pubs are plentiful also, and the best place to grab a drink is in the Hawkhill, Perth Road and West End parts of the city. If you're on a very tight budget, or are interested in preparing your own meal, then Tesco has many options available to you. The chain is prolific throughout the city to the point that locals sometimes refer to the city as "Tescotown". There is a branch in the city centre, one by the train station on the river side, one in South Road near Sterling Mills and another on the Kingsway. Other options available around town include ASDA and Morrisons supermarket. It is relatively easy to drive around Dundee and having a private vehicle is helpful if you hope to travel greater distances. There are taxis that are available and reliable. The local bus service is also very extensive with many different routes and connections. It is also reasonably cheap. There are options available including a 10 journey pass or an all day pass if you plan to travel extensively by bus.